Today Italy has seen its first national banking strike in 13 years as bank employees protested against plans by the ABI [Italian Banking Association] to cancel their collective work contract a year before it officially ends. Banks here, as elsewhere, are under pressure to cut costs and that, their chief executives have decided, means cutting jobs and changing contracts which offer workers a high degree of protection. The employees, naturally enough, want executives' high salaries to be cut instead and they want a guaranteed fair wage themselves. Over 300,000 bank employees could be affected by the proposed contract change. Nobody likes bankers much anywhere at the moment but I think most of us know that our problems are not the fault of the young bank clerk we usually see behind the counter. Just to make sure of that, though, demonstrating employees have been handing out flowers to the public in an effort to show that banks really do provide a public service. Do we agree with that? I wouldn't bank on it! I can't help feeling that the banking unions chose the date of their protest rather cleverly as tomorrow is a holiday [All Saints] and their members will get quite a nice little break. There was no counter service on Tuesday afternoon due to union meetings either. But let us not be churlish - who can blame anyone for wanting to extend a bank holiday? These were a welcome gift from my friends at the Museo della Memoria - Sicilia 1943 this morning and they've asked me to tell you that they are now on Trip Advisor. 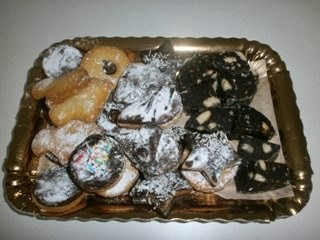 That's chocolate salame you can see on the right. Darkness is falling earlier and it's the end of October but there seems no end in sight to the "boatloads of sorrow" arriving on Sicily's shores: on Sunday the Italian navy saved 408 migrants, including 80 children and 40 women, from a boat in trouble off Augusta [Siracusa] and yesterday a Coast Guard patrol rescued 41 migrants whose boat got into difficulty 70 miles off Lampedusa. Another naval vessel went to the aid of a boat carrying 97 migrants, among them ten children. Yesterday was also the day when the Comitato 3 ottobre - formed after the migrant tragedy on that date this year - presented its proposal for a law making 3rd October a day of remembrance to groups in both the Senate and the Chamber of Deputies. Under the proposed law, the text of which, most unusually for an Italian bill, contains only two articles, 3rd October every year would become a day to remember all migrants who have died fleeing persecution, oppression, poverty and war together with all who have risked their lives trying to save them. Members of the Committee have asked for meetings with President Napolitano and the presidents of both houses. Meanwhile yesterday a group of around 100 migrants blocked the road to San Vito Lo Capo [Trapani] in protest at shortages in the reception centre at Bonagia and at delays in the processing of documents which would allow them to remain in Italy. I have a concern which no one, to my knowledge has yet raised and it is this: if in Italy there are groups of migrants who are not being assisted and whose cases are not being heard urgently, they will surely become depressed, disillusioned and angry. How will the experience change them and who is lying in wait to take advantage of their situation? Yesterday a heroine of mine and, I am sure, of many readers of this blog, Daw Aung San Suu Kyi, arrived in Rome for a series of meetings as part of her European tour. "The lady", as she is often called, is a heroine here, too and I would like to add my voice to the many that have welcomed her to Italy. Aung San Suu Kyi first travelled to the Campidoglio where she received, 19 years late, the scroll that makes her an honorary citizen of Rome. This honour was awarded to her in 1994 but, as she was under house arrest at the time, she was unable to accept it in person. At last, yesterday, it was presented to her by Mayor of Rome Ignazio Marino and one of his predecessors, Francesco Rutelli. In her acceptance speeech, Aung San Suu Kyi remembered visiting Rome as a student 40 years ago, when she had been very impressed by the friendliness of the people. 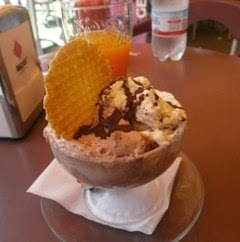 She had enjoyed the gelato, too! Mr Marino told her that Rome would always be with her and that the world needs people like her. "The lady" also received the Rome Peace Prize and Roberto Baggio, who had accepted it on her behalf in 2007, was visibly moved. He said that Aung San Suu Kyi's battles for freedom had not only changed the destiny of her own people, but also the everyday lives of others. This morning Prime Minister Letta received Aung San Suu Kyi at the Palazzo Chigi and assured her of his full support in her work to advance Burma's transition to democracy, particularly with regard to the constitutional reforms that will be necessary. Mr Letta thanked "the lady" for her tireless fight for democracy and freedom and invited her to Expo 2015 as food security, one of the themes of the festival, is of interest to her. She accepted the invitation with pleasure. Later "the lady" discussed human rights and religious freedom in a private audience with Pope Francis and afterwards met President Napolitano, Foreign Minister Emma Bonino, President of the Senate Pietro Grasso and Laura Boldrini, President of the Chamber of Deputies. The Eternal City loves you, Daw Aung San Suu Kyi. Please come again soon! His Royal Highness Prince George Alexander Louis of Cambridge is not a baby likely to want for gifts but I hope he will be told one day of the very special one he received from the Consorzio di tutela di cioccolato artigianale of Modica on the occasion of his christening. I suppose that the footmen of St James's Palace are, like most royal servants, inscrutable but I'd like to know what the footman who took delivery of a package of 30 bars of Modican chocolate on Wednesday really thought. The bars were made by chocolate master Ignazio Iacono, who followed an original recipe from 1746. They contain paste made of cocoa from Ecuador, Italian sugar, vanilla from Madagascar and cinnamon from Sri Lanka. [No dairy products are added to traditional Modican chocolate.] 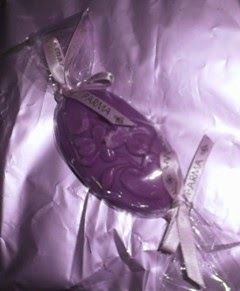 The bars have a commemorative wrapping which contains the message, "Sweet greetings". 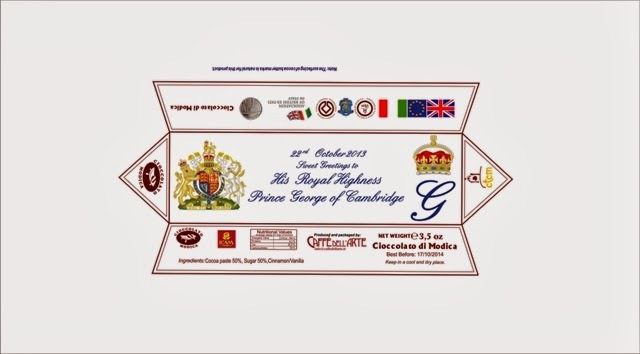 In a thoughtful and generous gesture, the Consorzio is also offering commemorative bars to all British babies born on the same day as Prince George. Come on, Georgie - grow those teeth! Regular readers will know that I am following the political career of Italy's Integration Minister Cécile Kyenge, so I would like to point you all in the direction of what Foreign Minister Emma Bonino had to say about her in this clip from a hard-hitting interview with Zeinab Badawi today. The interview was part of the BBC's 100 Women Conference. I hope you find it as interesting as I did. This is quite a year for anniversaries and although much has been made of the Verdi bicentenary outside Italy, there has been less coverage of the 700th anniversary of the birth of Giovanni Boccaccio. There is still time, for although we know the year, 1313, no one knows the exact date of the writer's birth. The people of Certaldo believe it happened in their town and it was certainly there that Boccaccio died on 21st December 1375. 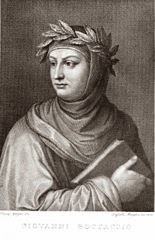 Celebrations of Boccaccio's life and work are taking place now in Tuscany and will continue until the end of this year. It was all going splendidly until, in September, some advertising posters which appeared in Certaldo, Florence and other Tuscan towns caused a storm, for they featured four young women striking suggestive poses in minimalist underwear. The result was rather more suggestive than if they had been wearing nothing at all. Anyone who has read the Decameron knows that it is not without a degree of bawdiness but the posters did not look to me as if they were trying to convey this. The Equal Opportunities Commission of the Province of Florence complained, saying that the posters were offensive to women and delegates to the women's conference of the Federazione Empolese Valdelse said that the Boccaccio septcentenary was not taking place in order to launch an underwear range but to celebrate the culture of a region. The president of the cultural association which had overseen the production of the posters responded that they were not advertising posters but were urban art. Hmmm - nice one, but it didn't work, for then the Quirinale, the President's office, got involved and the Prefect of Florence received a cordial but firm note offering town administrators the choice of removing the posters or removing the presidential seal of approval from the whole Boccaccio project. The Prefect promptly issued an "invitation" to the Mayor of Certaldo to supervise the removal of the posters, which was done. Photos of the posters can be found online but I don't want to feature one on my blog, for the reasons given by the women's organisations mentioned above. This is another case of Italy shooting itself in the foot but this is a country where "Miss Italia" is prime-time viewing so I give up. Incidentally, my favourite Decameron story is the tale of Madonna Oretta and my least favourite is the last, the tale of Patient Griselda [whom I had first encountered in Chaucer, where she also drove me mad]. If ever a woman was in need of a homily from the sisterhood, it was she. To be fair, the Boccaccio celebrations include some fine initiatives. You can find out more about them here. My fridge-freezer has - or perhaps I should say "had"- a temperature display which lights up on the outside and this usually shows a stable 3°C. Not so on Sunday morning, however, when my heart froze [which is more than I can say for the contents of the machine] at the sight of 20°C on the display. Why? Everything was perfectly all right on Saturday and there had been no indication that it wasn't working properly. OK, my fridge-freezer is 13 years old and I brought it with me from the UK but isn't a major household appliance supposed to last 15 years? During the afternoon the temperature went slowly down and by evening had reached the magic 3°C but as soon as I opened the fridge door, up it soared again and it stayed up. At 7 am on Monday it had gone down to 4°C but an hour later it was back at 20°C. At that point I called a technician who promised to come in the evening. He did and was a little taken aback, as all Italians are, by my numerous fridge magnets but, having recovered himself, announced that he would have to take the contraption away to examine it and would need to bring a colleague to help him, either today [Wednesday] or tomorrow. You guessed it - it's going to be tomorrow. It's been hell without a functioning fridge these last four days and I'm going bonkers without cold drinks. Yes, I know our grandmothers - and even my mother's generation, until the mid-1950s - managed with pantries and meat safes but our needs and expectations are relative. The fact that it didn't happen in summer is cold comfort, for, apart from the cold drinks issue, in Sicily you have to keep most fresh fruit and all dried fruit and nuts in the fridge if you want to avoid rapid deterioration and discourage unwelcome visitors in your store cupboard. I'm pretty sure the fridge man thinks the machine is beyond repair and how I am going to replace it is a worry. I don't think it is generally understood that when you're on your own an event like this is not an inconvenience but a disaster and, having endured quite a few disasters this year, I'm feeling sorry for myself! But, in the cold light of day, I've been thinking: why do I need a big freezer anyway? It's a British habit, not an Italian one, to freeze large quantities of food. I do tend to cook the full quantity of a recipe and then freeze what I can't eat immediately in small portions and this is partly because I've read too many magazines which panic you into preparing for uninvited hordes. More sensibly, it is also so that I'll always have something to hand if I'm feeling ill and not up to cooking. If I'm honest, though, I do not entertain hordes, invited or uninvited and I'd have to be ill enough for hospital not to feel like cooking. Having long abandoned my efficient British habit of keeping an up-to-date freezer inventory on the side of the cabinet, I no longer knew what was in the freezer and was working up to clearing it out one fine day. 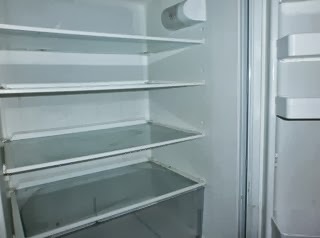 So perhaps it's time for me to get an Italian-style fridge with only a small freezing compartment on top - if and when I can afford a replacement, that is. The fridge man has said he will bring me an old fridge to use while he makes his diagnosis and as for a replacement - as soon as I can make some I'll put the decision on ice. "TIME TO TEAR OFF THE MASK"
The state memorial service for the migrants who died in the tragedies off Lampedusa of 3rd and 11th October was held in Agrigento this afternoon [Monday] in the presence of Deputy Prime Minister and Interior Minister Angelino Alfano, Integration Minister Cécile Kyenge, other Italian government representatives, civic dignitaries and, controversially, representatives of the government of Eritrea. As Eritrea was one of the countries that the migrants were fleeing, many mourners thought it was inappropriate for these politicians to attend. After the interfaith service Mr Alfano was heckled as he spoke to journalists and there were cries of "Murderers! Enough of the Bossi-Fini law!" The Bossi-Fini law, introduced in 2002, made illegal immigration, and aiding it, a crime. This may seem fair enough but no one could have predicted the numbers of people trying to escape oppressive régimes now and it would clearly be outrageous to brand every migrant trying to reach Europe a "criminal". One of the unexpected effects of the law has been that fishing vessels sometimes do not go to help migrant boats in trouble because their crews fear being accused of aiding illegal immigration. The Italian government had suggested granting citizenship to the migrants who died and protesters today wanted to know what is going to happen to the survivors. Are they, for instance, all to be regarded as criminals? The irony is not lost on the survivors themselves, some of whom were pictured with notices saying "Sorry we didn't drown" last week. Mr Alfano said that the deceased migrants had been accorded dignified burials and that the survivors would receive the assistance they needed. He also reminded journalists that the Italian police are still determined to find and arrest all the "merchants of death" - the people traffickers. Governor of Sicily Rosario Crocetta said that it would have been better to have held the service in the presence of the survivors - a reference to the fact that it was not held on Lampedusa - but that today was not the right time to argue about it. It would have been pretty hard not to be drawn into the discussion, however, as everybody had a criticism to make: Mosé Zerai, a priest representing the Eritrean community in Italy, said that the service had been arranged late and hurriedly and many people, including the families of some of the victims, had been unable to make arrangements to attend. He was also unhappy about the presence of the Eritrean politicians. Michele Pagliaro, general secretary of the CGIL Union in Sicily, said the ceremony had been late and inadequate and vowed that his union would campaign for a change in immigration law as this would be the best way to honour the victims of the tragedies. Marco Zambuto, the Mayor of Agrigento, went further and called the event a "state farce". Integration Minister Cécile Kyenge, however, said that today had been important because it was the first time that non- Italians had been honoured in a state funeral ceremony. It was, though, Giusi Nicolini, the Mayor of Lampedusa, who painted the most vivid picture of the situation the migrants and the islanders face: Unable to attend the ceremony because of a pre-scheduled meeting with President Napolitano, Giusi Nicolini spoke in the Senate. She said that migration policies reflect the type of society that a country has and impact upon the places where migrants land. Therefore, she said, Italy's migration policies are doubly unjust because they are unjust to the people of Lampedusa, too. Mayor Nicolini said that there was no need to follow the coffins to see the reality, which is that the current situation is the tip of the iceberg, with the Mediterranean becoming a cemetery. She said that immigration policy must change and that Italy must be clear about where the migrants will go after they land. "It is time", she summed up, "to tear off the mask and act." Giusi Nicolini is also asking for 3rd October every year to become a day of remembrance for migration victims. So there you have it: a "state farce" with some probably unsuitable guests, a "catwalk for politicians" [Mr Zambuto's words again] or a compassionate if not always efficient country doing the best it can in difficult circumstances? I tend to the latter opinion but I do agree with Mayor Nicolini that it is time to "tear off the mask." If you travel through the Merthyr Vale in Wales and happen to glance up at a certain point, a sad sight awaits you, for you will see rows of pristine white, stone arches, each of which guards an immaculately tended grave. These are the graves of the majority of the victims of the Aberfan Disaster of 1966, an event which no one living in Wales at the time will ever forget, just as Sicilians will never forget the migrant tragedies of 3rd and 11th October of this year. I was reminded of that faraway hillside this morning when I saw pictures in the Italian press of the hastily but carefully constructed stone chapels that now grace a hillside in Agrigento and contain the bodies of many of the lost migrants. Each chapel in the Piano Gatto Cemetery contains the bodies of up to 14 victims of the disasters and on the exterior walls the deceased are identified by numbers. This is not only because many could not be identified but has also been done to protect some of the families of the deceased from possible repercussions in their countries of origin. The Mayor and Vicar general of the Archdiocese of Agrigento brought wreaths for each chapel. The cemetery superintendent told the Corriere della Sera newspaper that he cannot erase from his mind the image of so many coffins arriving by lorry last Sunday. Migrant burials have also taken place in other cemetries in Agrigento Province and in all cases the mayors of the towns involved have offered their full cooperation. In at least two of the cemeteries, interfaith funerals have taken place. In an extraordinary humanitarian gesture, two families offered to have three of the migrants - among them a mother and baby - buried in their own family tombs in Agrigento city's Bonamorone Cemetery and this has now happened. A state memorial service for all the migrants will take place on the San Leone jetty in Agrigento at 4pm on Monday, in the presence of government representatives. The Mayor of Lampedusa, Giusi Nicolini, is understandably upset about this, as she will be unable to attend herself due to a pre-scheduled meeting with President Napolitano and because she feels that the citizens of Lampedusa have a right to be involved in this service. Meanwhile, some of the relatives of victims of the Sampieri tragedy of 30th September have been asking for repatriation of the bodies. They say that the Eritrean government is willing to take responsibility for such a transfer and that they do not understand why the Italian government will not give permission for it to go ahead. Let us hope that the migrants buried in Agrigento Province find, in death, the serenity that was so cruelly denied them in life and, like the lost of Aberfan, may they sleep in peace. 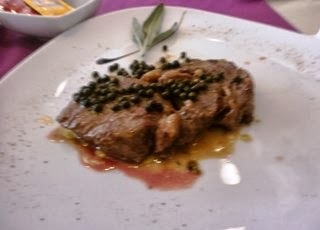 Then an Italian version of steak au poivre for the main course - excellent. After that lot we decided to be good and take some exercise, so we walked to another bar for ice cream. Whilst the world continues to focus on the migration tragedy of 3rd October and subsequent migrant boats that have arrived on Sicily's shores, the town of Scicli has been remembering the 13 migrants who died off the beach of Sampieri on 30th September. 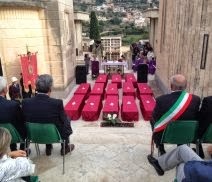 Their funeral service was held in Scicli yesterday in the presence of Domenico Manzione, Undersecretary of State for the Interior, the Mayor of Scicli, the Prefect, Police Commissioner and Mayor of Ragusa, other dignitaries, representatives of the emergency services and other citizens. Relatives of some of the deceased Eritrean men also attended the service, having travelled from other European countries where the men had probably hoped to settle. And the sea arose by reason of a great wind that blew. So when they had rowed about five and twenty or thirty furlongs, they see Jesus walking on the sea and drawing nigh unto the ship: and they were afraid. But he saith unto them, It is I; be not afraid. Mr Manzione brought messages of sympathy from President Napolitano and Prime Minister Letta. He said that he had not wished to speak yesterday as he regarded it as a "day of silence" but did say that he hoped the young men were now in a better world and that we who are left behind must guarantee humane treatment for those fleeing oppressive régimes. Mr Manzione had also been very moved by the Coptic priest's words and said that the genuine sorrow of both the Eritrean and Italian communities was an example of the real meaning of solidarity. All the coffins were draped in red, the colour of the city of Scicli, for the funeral. Relatives of the four Muslim men among the dead asked that their loved ones be buried in the Muslim section of the cemetery in Ragusa Ibla, a request that has been granted by the Mayor. It brought back the fragrance of Devon violets, which I wrote about some time ago, to me. Have a nice evening, everybody - I'm off to have a luxurious bath! When one thinks of a vicolo in Modica, it is usually a little street like the one below that comes to mind - something like the one described by Modica's Nobel laureate Salvatore Quasimodo in his poem Vicolo. [There is a translation here.] One does not think of a busy, modern street like the one I live in. It is laudable of the Comune di Modica to go round giving these little streets their own names and honouring the great and the good of Italy in doing so, but it might be a wise move to inform residents of the change. The online stradario of Modica tells me only what I already know, which is where the street begins. 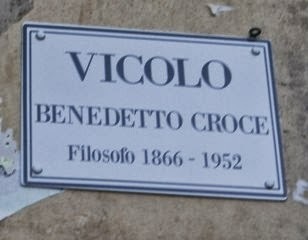 Incidentally, Benedetto Croce was the first philosopher whose work I read in Italian at university. I don't know if I officially live in his street but I'm being philosophical about it. As I write, BBC World is leading with the news of yet another tragedy involving a migrant boat in the Mediterranean: there are conflicting reports as the rescue operation is ongoing but what we know so far is that the boat got into trouble early this evening 70 miles off Malta and 60 miles off Lampedusa, where it was probably headed. Maltese military and Italian naval vessels were already in the area, following last week's tragedy, and the boat was spotted by the Maltese Air Force, who alerted the Italian authorities. The boat was carrying at least 250 people and, according to the BBC, capsized when most of the passengers ran to one side in an attempt to signal their plight to a passing aircraft. Corriere della Sera is reporting 50 dead so far, including ten children. A Maltese vessel has saved 150 migrants, among them 17 children and an Italian naval vessel has rescued 56 people, including nine children. There are reports that ten rescued children have already been flown to Lampedusa. Italian Prime Minister Enrico Letta and Maltese Prime Minister Joseph Muscat have spoken on the telephone and have again agreed that coordinated EU action is required to halt such tragedies. I presume that, if the BBC is reporting the story, it is making headlines around the world but I cannot help reflecting that the world was not much interested in Mediterranean migration until the magnitude of last week's tragedy off Lampedusa woke it up. But these tragedies did not begin with the "Arab Spring" or the civil war in Syria: as one of my commenters reminded me last week, I have been writing about them for a long time - since 2006, in fact - and, for those of you who would like to know more about how these events have affected Italy and Sicily in particular, I have this evening placed a new page, called Posts about migration in the Mediterranean, under the blog header. This page contains links to all my posts about migration in the area. Among them you will find many tales of tragedy - and yes, of evil - but also remarkable stories of generosity, humanity, bravery and love. The death toll of the tragedy of 3rd October is now 339 but the recovery operation is not finished. The media outside Italy has made much of the fact that Prime Minister Letta and the President of the European Commission, José Manuel Barroso, were heckled when they visited Lampedusa this Wednesday but I have seen few reports in the foreign press of Mr Letta's humility: he knelt in front of the coffins in the airport hangar on Lampedusa and apologised for his country's inadequacies when faced with such a tragedy. Both men were visibly shaken by what they saw and Mr Barroso was especially upset by the sight of a coffin containing a mother and newborn baby, with the umbilical cord still attached. Mr Letta has promised a state funeral for the victims and, although he has been accused of using them to "play politics", I believe that the gesture has been made in good faith. There is no word yet of when and where this will take place and among those who want to know is the Mayor of Lampedusa, Giusi Nicolini, who has to deal with the arrival on Lampedusa of some of the victims' relatives, who are of course asking where their loved ones will be buried. Not all politicians are happy about the state funeral plans and an amendment to the so called Bossi-Fini Law, under which illegal immigration is a crime, has also caused a storm. Under the amendment, passed in the Senate on Thursday, illegal immigration will no longer be a crime but possible measures against it such as deportation or detention will remain in force. Some unlikely alliances have been formed to fight the amendment and we must wait to see what happens. Once again, a ray of light has been brought into this sombre situation by Pope Francis, who today sent international phone cards to the survivors on Lampedusa. Sometimes I think Pope Francis has more common sense than all the politicians put together. 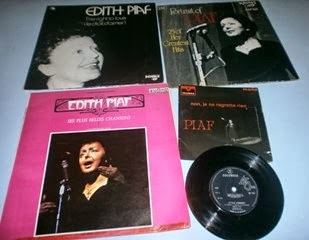 Some of my Piaf vinyls - Je sais comment is the flip side of Milord. Today sees another anniversary, this time in that other country whose culture has had an enormous influence on my life - la belle France. Fifty years ago, on this night, "la Môme Piaf" [the "little sparrow"] died, leaving behind a whole catalogue of songs which were, for the most part, sad love stories and a tale of a tragic, yet triumphant, life. Édith Piaf's life story is well known so I won't repeat it here but I will say that by the time she met her last love, Théo Sarapo, I was old enough to rejoice for her, as did millions of Frenchwomen. Édith Piaf et Théo Sarapo - A quoi ça sert l'amour? I like to think that Édith is with Théo now and with Marcel Cerdan too, for I'm sure that God forgives love. 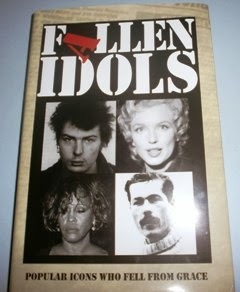 Some years ago, in Paris, I decided to look for Piaf's tomb in Père-Lachaise. I happened to enter by a side gate where there were no maps on sale and I remember wandering around cursing and lamenting the fact that people unhelpfully refuse to die in alphabetical order. Eventually I found the tomb and, thirty years late, laid my rose upon it. "Édith Piaf epitomises that enduring strand in western popular culture of women who dedicated their lives and work to men, and sang songs about how right that was. The implications for women have been enormous." I agree but Édith Piaf is no less great for that. I am not going to say, "Happy birthday, Verdi" as I abhor the online habit of wishing the dead a happy birthday / Christmas / weekend / everything but I am going to mark the composer's bicentenary on this blog. Actually, there is some doubt as to whether Giuseppe Verdi was born on the 9th or 10th October 1813 but let's do it today. Italy is doing it tomorrow. The Guardian has already asked its music writers for their favourite "Verdi moments" and you will find mine at the end of this post. Yesterday we went to seek out "Verdi land" which is near Parma. We started at Roncole Verdi [formerly Le Roncole] to see the composer's birthplace. It's such a modest little house for someone who was to become so famous! It has a stone floor and walls and no lining of the roof. It was an inn and changing station for horses and Verdi's father ran a small grocery store next to it. Nearby is San Michele Church where Verdi learned to play the organ. We went on to Busseto. Here there is a Civic Museum, housed in the Villa Pallavicino: it has letters written by the master, manuscripts, opera posters and portraits of the Verdi family. The painter is usually Levi, born in Busseto. You can see Verdi's spinet, which his father saved up for. Verdi received it when he was nine. There is also a double bass which he played. 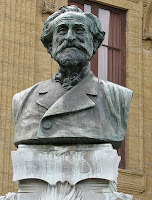 In Busseto, Verdi was encouraged by a local businessman, Antonio Barezzi and he later married Barezzi's daughter Margherita. The couple had two children, who died young. Margherita died after only four years of marriage. Now I understand how Verdi came to write so much sad and moving music. 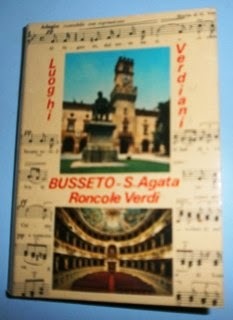 The Milan Conservatory said that Verdi had no musical talent! Verdi's second wife was the soprano Giuseppina Strepponi but they had no children and the couple adopted a girl - the daughter of a cousin - from Roncole. When Verdi was 55, the Teatro Giuseppe Verdi was opened in Busseto. It is a lovely theatre - very intimate and familiar, but with wonderful accoustics. Busseto is only a little town, but the love of its people for the "maestro" is evident in the way the theatre and museum are kept. I really think it's the nicest little theatre I've ever seen. Toscanini conducted there twice. Concerts are also held in the piazza in Busseto. Further on, in Villanova sull'Arda in Piacenza Province, is the Villa Sant'Agata or Villa Verdi. This is preserved much as Verdi left it and the guide there really knows her stuff. [You have to ring and wait for her - we nearly went away as we thought no one was coming!] She referred to Verdi as "il maestro" throughout her talk and you felt that she knew him - which, in a way, she does, living among all his belongings and telling his life story every day. The first room you see is the one in which Giuseppina died and the second is the room where Verdi worked and slept. There are two pianos in the house - one that the composer used up to "Aida", and the other one that he used afterwards. There are portraits of his parrot and a little dog - he loved animals and the guide assured us that when he went hunting, he never killed. We were shown the glove that Verdi used to conduct the Requiem for Manzoni - the only time he conducted in public. A bust of Manzoni is on display. There are two small studies and then a room which contains the furniture from the Milan hotel room where Verdi died. It was all donated to the villa by the hotel. It was a very rainy day and we'd had difficulty in finding the villa and then there was the wait in the cold for the guide but it was worth it! It was the 24th April, the anniversary of my Dad's funeral. I so wanted him to know I was in Verdi's house! What beauty Verdi brought to this earth, and from such humble beginnings, yet he was true to his origins to the last. Incidentally, part of Bertolucci's "La Luna" was filmed in the countryside surrounding the villa. If you go to the Villa Verdi, I can't promise that you will get the same, knowledgeable guide as I did all those years ago but it is possible in Italy! Happy Verdi Day, wherever you are! On the night of 3rd - 4th October, in the Lombard city of Bergamo, Enrico Panattoni, restaurateur and inventor of stracciatella [vanilla with chocolate shavings] ice cream, died, aged 85. Mr Panattoni invented stracciatella in 1953, the year that he and his wife, Oriana, opened the Marianna bar and restaurant in Bergamo. 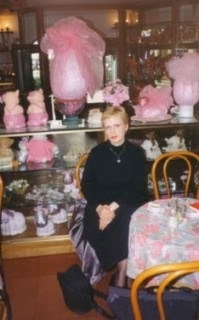 Now, some of you may remember that when I first came to Italy, in 1969, it was to teach English in Bergamo and there I spent many happy evenings in the Marianna with my Italian boyfriend of those days. 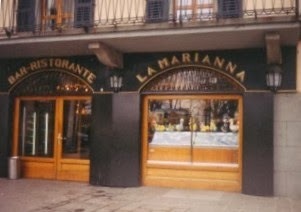 In 1996 I took a sentimental journey to Bergamo and sat once more in the Marianna, this time with my memories. So thank you for the delicious ice cream flavour, Mr Panattoni, but most of all, thank you for my "Marianna nights". I don't hear the term "fusion cooking" much any more but then, I do live in a place where most people just do not want to try food from other lands! I, however, still sometimes hanker after strong spices and, on those occasions, a smidgin of cinnamon or red chilli pepper will not do. 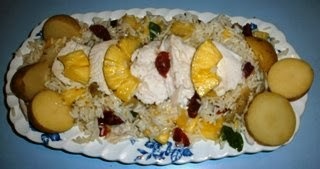 A few weeks ago, I made up this recipe for poached chicken - a neglected way of cooking one, I feel. It is a popular way of cooking chicken breasts but you can also cook a whole chicken by this method. 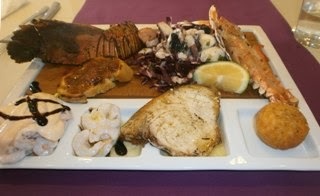 The Sicilian ingredients are cinnamon and red chilli pepper in decent amounts and the lemon. If you add carrots, they could be sweet, Sicilian ones. OK, now the size of the chicken you use will depend on the size of the largest pot you've got with a lid. Because I have a couple of large but not enormous pots, I only poach a whole chicken when I can get a small one, which is difficult in Sicily, though not in the UK. You need a pot that will take your chicken, plus a few vegetables and spices, comfortably and in which there is room to cover the chicken with liquid plus one inch. Having selected your pot and got your chicken, season the inside of the chicken with coarse seasalt and a few twists of mixed peppercorns. Add half a lemon., half a red onion, 1 unpeeled garlic clove, 2 fresh bay leaves, a little dried oregano and knob of peeled, fresh ginger. Close the opening with a wooden skewer or some cocktail sticks. Put the pot on the heat, bring to the boil, then put the lid on and lower the heat. Simmer for 50 mins., then turn the heat off and just leave everything for 10 mins. The chicken will be so tender that it will be falling off the bone. Cook 500 gr rice suitable for salads according to the instructions on the pack. Drain and rinse several times in cold water. Transfer to a large serving bowl. Add the slices of a whole, fresh pineaapple, a chopped red onion, a few chopped aubergines that have been preserved in oil, some fresh basil leaves and some sundried cherry tomatoes over which you have sprinkled a little oil. Put the mixture in the fridge until you are ready to serve. Make up a dressing of 6 tablesp olive oil, 1 tablesp red wine vinegar, 1 tablesp honey, a little dried oregano and a seasoning of a couple of twists of mixed peppercorns and fine seasalt. Mix all together and put the bowl in the fridge till you are ready to serve the salad. Then chuck the dressing over and toss with a spoon and fork. You can either serve the carved chicken - it won't need much carving! - with the potatoes and some of the cooking liquid and serve the rice salad separately or you can serve the slices of chicken on the salad with the potatoes around them. I prefer to do the latter. 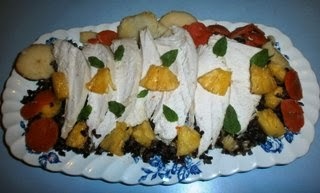 I've also seved this with this black rice salad [and I remembered the carrots that time!] but I think I prefer yesterday's white rice version. At the end of this tragic week in the Mediterranean, it is a hymn from my own country that comes to mind. I post this with respect for those of all religions and none. Italy, on the day of its patron saint, Saint Francis, is marking yesterday's tragedy at sea with an official day of mourning: On Lampedusa many businesses remained closed as a mark of respect, flags are flying at half-mast nation-wide and in schools a minute's silence for the migrants who died was observed this morning. Searches for more bodies were temporarily suspended because of a rough sea and bad weather earlier but continue as I write. Half of the bodies that have so far been recovered are those of women. Four children aged between one and four years are also confirmed dead. Some bodies have today been transferred to the island's airport - described by one newspaper as having become "the hangar of death" - as the mortuary could no longer cope with the numbers. Coffins have been taken to Lampedusa from other parts of Sicily. Mayor of Lampedusa Giusi Nicolini has said that today marks a new point in the migration story because this tragedy has made the "invisible situation" visible to the whole world. Let us hope, then, that the whole world will act to stop events of this nature happening again. Integration Minister Cécile Kyenge has said that she herself could have been on that boat and that now is not the moment for politicians to start blaming each other. Deputy Prime Minister and Interior Minister Angelino Alfano, who has seen the horrifying scenes on Lampedusa for himself, has joined calls by Corriere della Sera readers for Lampedusa to be awarded the Nobel Peace Prize for the way in which it has shown compassion and helped the migrants who have arrived there over many years. [This idea was also put forward by the Italian government in 2011.] As the journalist Fabrizio Gatti pointed out in an article in L'Espresso this morning, the EU, an organisation notable for its failure to help in the migration crisis, has been awarded the prize. When I last looked, nearly 25,000 people [including me] had signed an online petition in support of the island's candidature. "So many of you have been despoiled by this barbaric world which does not provide work, does not help people and does not care if children die of hunger or if many families have nothing to eat and do not even have the dignity of being able to bring home some bread. This world does not care about the many people who have to flee slavery and hunger and leave their countries in search of freedom. And so often, with so much pain, we see that what they find instead is death, as happened yesterday on Lampedusa." The Pope wants disused churches and monasteries to be converted into accommodation for refugees - a much-needed practical suggestion in these days of sorrow. Let us also remember, this evening, the Coast Guard and other emergency services who saved so many and continue to risk their own lives in the recovery operation. Just as I was thinking that I would be able to bring you a little light relief this evening, I happened to glance at the Corriere della Sera site and saw the news of a further tragedy at sea which is unfolding as I write. Early this morning fishing boat crews raised the alarm when they saw a migrant boat in difficulty off Lampedusa. The 20-metre boat is reported to have been carrying at least 500 Eritrean, Somali and Ghanaian migrants, among them around 100 women and an unknown number of children. A survivor has told reporters that conditions were so cramped on board that the passengers were unable to move. The boat was near the southern tip of Lampedusa, off the Isola dei Conigli - which has a beach voted the second best in Italy in a web poll this summer - when the engine failed and the vessel began to take on water. Having no cellphones to call for help, some of the passengers lit a small fire to draw attention to their plight. However, fuel was leaking into the water on board and the fire became an inferno. Panicking, a large number of passengers scrambled to one end of the boat, causing it to capsize and then they began to jump into the sea. Many could not swim and so far 93 bodies have been recovered. Only three of the women passengers are said to have survived and a three-year-old child is confirmed dead. As I write there is no news of the other children. The last Italian report I consulted said that 159 migrants have been rescued but Italian Coast Guard and police fear that there could be 40 more bodies under the boat and up to 100 inside the wreck. Survivors say that the boat left a Libyan port two days ago and that, prior to the lighting of the fire, three fishing boats had spotted the vessel in difficulty but had done nothing to help. This is unconfirmed. One people-trafficker has been arrested. Mayor of Lampedusa Giusi Nicolini has described a scene of "continuous horror" as bodies are being laid out on the quayside there. Prime Minister Letta has spoken of a "terrible tragedy" and Deputy Prime Minister and Interior Minister Angelino Alfano has already arrived in Sicily. He has said that he hopes that the EU recognises that this is an event which involves every EU country. A few minutes ago, Mr Alfano said that he had seen the 93 bodies, a horrifying sight which he had never imagined he would see. He reiterated that Europe must act to prevent this kind of tragedy. "These women and children did not die to come on holiday", the shocked Minister said. The UN High Commissioner for Refugees, Antonio Guterres, has praised the Italian Coast Guard for their swift action in rescuing so many. President Napolitano has said that Europe and the countries of departure of migrant boats must work together to stop the people traffickers and prevent disasters such as this one. Pope Francis has expressed his "shame" at what has happened and has called upon all nations to unite their strengths in order to ensure that such a tragedy does not happen again. Latest Italian media reports say that the death toll could rise to over 300. I cannot close without mentioning my disgust at the Italian political party which has used the situation in order to try to score political points this afternoon and I know that the majority of Italians will join me in this. 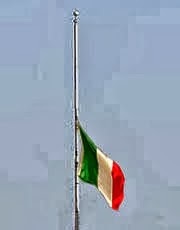 Update at 20.40: Tomorrow will be a national day of mourning in Italy. Update at 22.09: 127 bodies have now been recovered, among them those of children. Sky TG24 Italia has interviewed one of the fishermen who first raised the alarm. Visibly moved, he spoke of the horrific scene and how he and his colleague managed to take 47 of the migrants onto their own boat. It is with great sorrow that I have been following the news of a tragedy which occurred very close to home, on Sampieri beach [Scicli] yesterday. This is a beach where I have so often strolled, bathed and enjoyed myself and it is the beach which forms the background to many of the Montalbano films. At around 10 am yesterday, some tourists and others on the beach raised the alarm when they saw a migrant boat which appeared to be in trouble. The boat was crammed with desperate people, some of whom were already giving thanks to God because they thought they had reached safety as they were only 100 metres or so from the beach. What the beachgoers saw next, however, defies imagination: the boat, by this time, had run aground and the scafisti or people-traffickers were ordering the passengers to jump into the sea. Those who were unable to swim or were frightened were clinging, literally for their lives, to anything they could reach and then, horrifically, the scafisti started to hit them with sticks and wet ropes, forcing them to jump. The sea at that point was rougher and deeper than any of the passengers could have known and thirteen young men did not survive. Several newspapers, including a British one, have published pictures of the bodies on the beach and they are a sad and shocking sight indeed. An off-duty lifeguard and a carabiniere both plunged into the sea and rescued three people, then administered cardiac massage to save the lives of two of them. A bather who tried to help a man who turned out to be a scafisto received a punch in the face for his trouble. In all, 70 out of 150 - 200 Eritreans were brought to safety, including 20 children and a pregnant woman who was brought to hospital in Modica. She is reported to be still very unwell. One migrant who ran off to evade the authorities was hit by a car and was taken to hospital in Catania. A survivor told the AGI news agency that the passengers had each paid €300 - €1,000 to make the journey. The scafisti had told the migrants that they would be left at Sampieri because it would be easier for them to escape from there and continue their journey towards Northern Europe, where most of them wanted to go. Two suspected scafisti were caught by Coast Guard and Guardia di Finanza immediately and later the "mother ship" of the boat was located by Ragusa police and Carabinieri together with the Guardia di Finanza from Modica. Seven Syrians have now been arrested in connection with the tragedy. Five of the dead have so far been identified and the search continues for the body of another man thought to have drowned. Six other migrants were injured, one seriously. Police are also still searching for those who ran away. "The Mediterranean, the cradle of civilisation, has become a cemetery. We are witnessing a human tragedy which concerns every country in Europe." 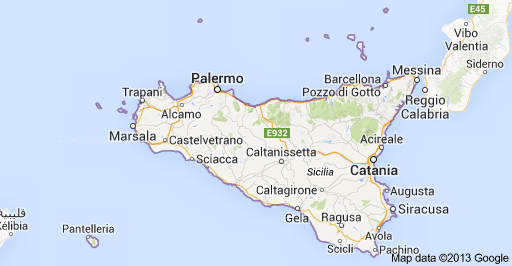 I'm a sort-of retired language teacher from Cardiff, Wales, UK, now trying to make a new life in Sicily. I'm not growing vines, making olive oil or restoring a palace stone by stone! "Sicily Scene" is mentioned as a regional resource on Italy. You can read some of my articles here. Sicily Scene by Pat Eggleton is licensed under a Creative Commons Attribuzione-Non commerciale-Non opere derivate 2.5 Italia License. 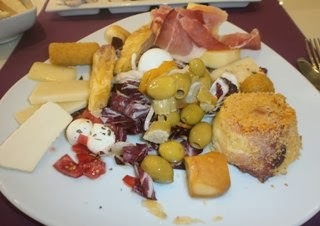 Permissions beyond the scope of this license may be available at lasiciliana629@hotmail.com. Special Announcement: I’m Writing an Amalfi Coast Guidebook! The Weekend in Black and White. I Am A Docent - My Baptism of Fire! Click on the image to visit James's blog. Best Blog outside N.America/UK; Best Little Blogger; Prettiest/Tastiest Blog.